Sports Illustrated concentrates not only the reportage of sport but also the emotions that make the story one worth telling. With contributions from the biggest names in sport journalism, respected for their vast knowledge, insight and access, as well as for its truly stunning photography. The magazine has made a mark for itself with its independent voice has become an arbiter of sporting status. Sports Illustrated India intends to mirror all of these attributes and is committed to pushing the boundaries of sports journalism and photography in the country, to compliment these values. 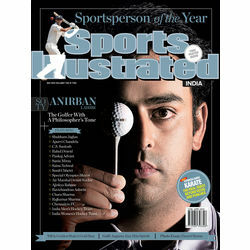 Sports Illustrated concentrates not only the reportage of sport but also the emotions that make the story one worth telling. With contributions from the biggest names in sport journalism, respected for their vast knowledge, insight and access, as well as for its truly stunning photography. The magazine has made a mark for itself with its independent voice has become an arbiter of sporting status. Sports Illustrated India intends to mirror all of these attributes and is committed to pushing the boundaries of sports journalism and photography in the country, to compliment these values.